My first attempt at debugging and I'm stuck. Am I not configred properly? Do I need lessons on RubyMine? ========================== Screenshot of source file with breakpoint set. I mean that for debugging ruby1.9 RubyMine should use ruby-debug-ide19 instead of ruby-debug-ide gem. We are investigating the problem. Thanks. 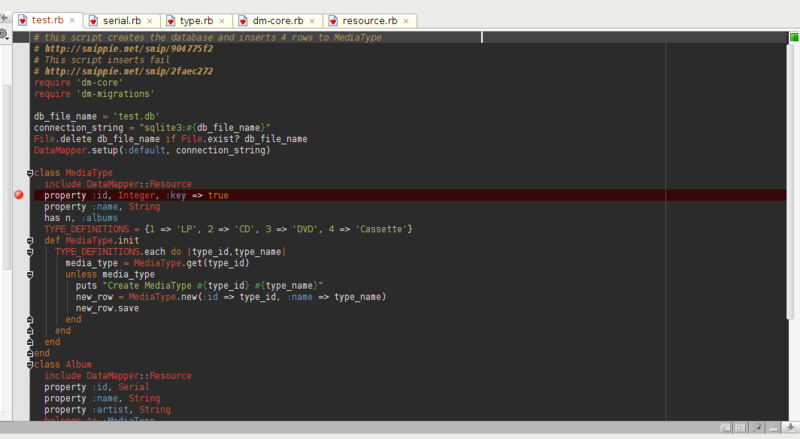 I switched to ruby-1.8.7-p302 and it picked up ruby-debug-base and ruby-debug-ide and debugging is working.